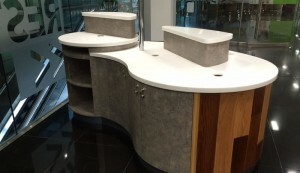 Expert in the fabrication and fitting of Corian® and Solid Surface Materials. 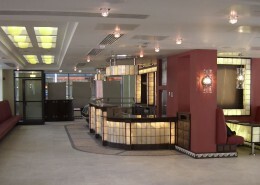 At Deanhouse Interiors we specialise in shopfitting work to the hospitality, retail and commercial interiors industry. We offer a bespoke manufacturing and fitting service, built on a reputation for quality and perfection. We also pride ourselves on being expert in the fabrication and fitting of solid surface materials such as Corian®, Hi-Macs®, Avonite®, Hanex® & Staron®. These products have the perfect combination of style & versatility and can be fabricated to form beautiful work surfaces with smooth joints, seamless curves and flowing lines. 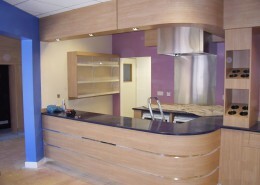 Our fabricators will form Solid Surface to your exact requirements. With a huge range of colours and patterns to choose from, you will have no difficulty finding the perfect combination to suit your room. 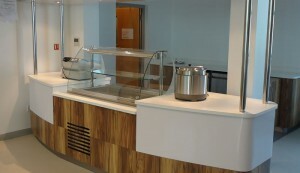 Not only will your scheme look fantastic, it will also be hygienic, practical and bespoke. All our workmanship is fully guaranteed. 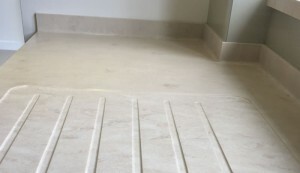 With years of experience of fabrication and fitting, our professional approach will ensure that you will be delighted with the finished fitted product. Sinks, draining boards and upstands can be fully integrated and moulded into surfaces. The Solid Surface can also be wrapped around any unit to create a low maintenance, hygienic finish which looks both stylish and elegant. 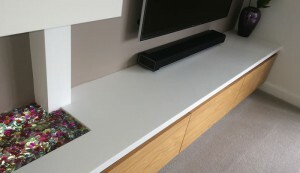 Created from a blend of acrylic and minerals, Solid Surface materials form long-lasting, extremely hard, non-porous surfaces with properties that allow the material to be manipulated into any shape or size, ideal for kitchens, bathroom, home offices, bar tops, reception counters and endless other applications. We have a dedicated team at Deanhouse Interiors who pride ourselves on a high quality of workmanship. Our jobs are approached with professionalism and focus, with customer satisfaction a top-most priority. Our Managing Director, Paul Fearns has many years experience in the joinery trade and has earned a reputation for achieving high standards and doing things “properly”. All services carried out including initial strip-out, mechanical engineering, ceilings and partitioning, floor finishes and decoration, joinery and shopfitting. We offer full site management including H&S and CDM compliance, liaising with clients, building facilities management, architects, designers, structural and mechanical engineers. 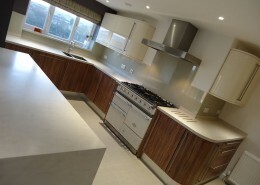 We manufacture counters, screens, panelling and solid surface worktops. In addition we offer CNC panel processing from shaping to edging. 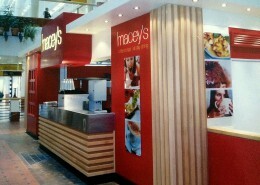 From initial concept designs we help find solutions to bring ideas to life. Here is just a small sample of our work. We can provide a more comprehensive perspective of the work we have undertaken during the course of any enquiry. Click on any of the project images below to view the gallery and the project overview. © Copyright - Deanhouse Interiors Ltd.